Circle Media Labs Inc., a category leader in delivering online screen time management and parental control solutions to families, today announced the release of Circle Home Plus, available for purchase now. The new full-service solution comes equipped with an in-home device and the Circle App, allowing users to manage online screen time and content on nearly every device whether at home or away. The Circle Home Plus solution leverages a cloud-based architecture to provide a seamless view of online activity across a user's devices. The in-home device offers a faster network connection thanks to a 1Gb Ethernet port and faster wireless connection. The Circle App, used with the Circle Home Plus device, enables users to easily manage all of their mobile and WiFi-connected devices. "Circle Home Plus is the simplest and most comprehensive screen time management solution, allowing families to find balance, set healthy limits, build good habits and get the best out of their digital experiences," said Tiebing Zhang, CTO and Co-Founder, Circle. "From laptops and tablets to smart TVs and video game consoles, parents can manage their family members' time spent on internet-connected devices at home and across all mobile devices on any network, everywhere." For those looking for a quick-start way to manage mobile devices on any network, the Circle App is also offered as a stand-alone solution. Available for $9.99 per month with a 30-day free trial for new users, the Circle App can now be downloaded via the Apple App Store and Google Play Store. The Circle Home Plus solution features Time Limits, which provides the ability to set limits for a variety of apps, schedule Bedtime and Off Time to automatically disconnect and reconnect devices from WiFi at scheduled times, Pause the Internet, set up Rewards, and use the Location feature to keep track of family members' mobile devices. Users can always filter content, and view usage and history. Additional features available with Circle Home Plus include Safe Search, which directs Google and Bing to remove explicit content from search results. Users can configure the Circle App to send notifications when family members reach limits or when a new device joins the network. For added flexibility, the product provides the option to manage a specific device or profile, whether that be a specific family member's device, or a device belonging to a guest who has joined the in-house network tied to Circle Home Plus. Each Circle Home Plus device also includes a built-in backup battery to ensure it keeps running even when unplugged. Circle Home Plus is available now for a MSRP of $129 at meetcircle.com and will roll out to additional retailers, including Best Buy, on April 14. 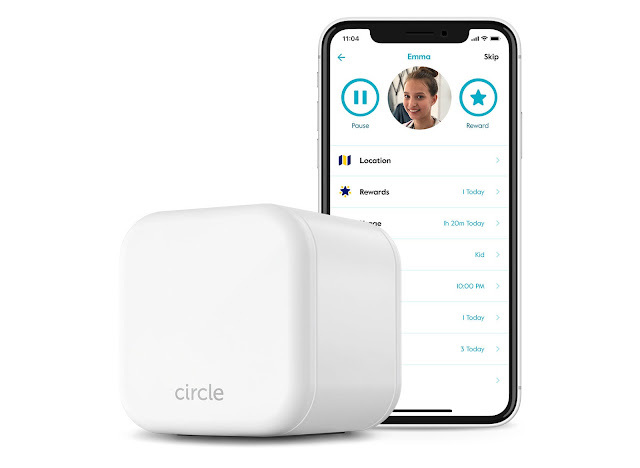 Providing great value, the purchase of Circle Home Plus includes the device that connects to the user's home network as well as a one-year membership that delivers full use of all features across devices inside and outside the home, no matter what network they are on. SOURCE Circle Media Labs Inc.